"Large or Small We Handle Them All "
Click here for a short video showcasing our services! 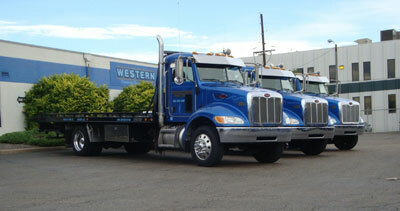 Western Towing & Recovery is all about delivering Customer Service 24/7, open all the time! You call a tow company because you need help and you expect prompt service. We do exactly that! We start with the critical element - DRIVERS!! We hire and retain some of the best most talented and skilled drivers in the industry, and then we give them the BEST equipment and the tools to work with. The combination of those two elements along with great dispatchers, managers, and most important......communication! This formula ensures that you get Customer Service time and time again. 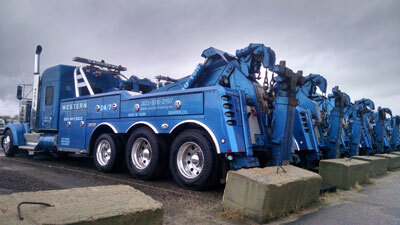 BREAKDOWNS-No one wants to have to call a tow truck, but we call because we need help. You don’t want to be taken advantage of. Knowing that Western has a fleet of 200+ long haul trucks, experiencing your same pain, you can be guaranteed that they know just how you feel and that you will be not be taken advantage of. We work very well with fleets, as we have one! We also work very well with big companies and are EDI compliant, work with logistic websites, satellite tracking and all the new upcoming electronic and paperless systems that big companies require. Our fleet experience allows us to use this in the towing business. ACCIDENTS – Having over 200 trucks Western knows exactly how expensive an accident is. The accident needs to be cleared quickly, with minimal damage, secured, and handled at the least cost to you. Fuel spill – we will get that cleaned up for you too! There also may be cargo involved. We understand that needs to be protected, transferred, and delivered immediately as that is how you get paid as an operator. Too many towing companies prey on accident victims and then send every truck they have to the scene and charge unnecessary and unwarranted charges that your insurance will not pay for. Too many of these companies survive off your one misfortune. Not Western Towing & Recovery, we send only what is needed to help keep your costs low and in line with what your insurance will pay for. Let our experience help you ensure you are not getting robbed. IMPOUND/STORAGE – allow us to put up Western Towing and Recovery signage on your lot at no cost to you and we will make those abandoned vehicles go away at no cost to you. Your parking lot is not somebody’s dumping ground, nor should it cost you anything, you need every space you can get! Call us today for more details! HAULING/LOADING/UNLOADING – We can do just about any type of hauling you need. Our lowboys can haul containers, machinery, and equipment. Having nothing to load it with – we have wreckers that can take care of that for you. Have an exotic or your daily driver needs moved across the country – we have enclosed transporters too. Reefer, van, end dump, armored, flat, you name it we can haul it for you or find someone that can! EQUIPMENT – we have a variety of equipment and are always adding and expanding every day to meet our customers’ needs and grow with the changing technology! Our trucks are satellite tracked, have two way radio communication, and cell phones too! REPAIR WORK - In addition to the above, we have a full service shop that can repair anything from automobiles and motor homes to large semi’s. Western’s shop has over 33 mechanics on duty daily to service your needs. You can tell by Western’s equipment, they know how to maintain and repair equipment! Our shop is on standby and willing to give you quotes on your repair needs anytime – give them a call at 303-292-1535. As always, Western offers excellent people, equipment and service.